Today is a day of great significance as it marks the remembrance day of fallen Police heroes who have courageously sacrificed their lives during the past 155 years to protect the lives and property of Sri Lankan citizens. The Sri Lanka Police is the establishment which is entrusted with the great responsibility of ensuring the safety of the public from the moment of their conception, birth and existence as social beings, till their demise. 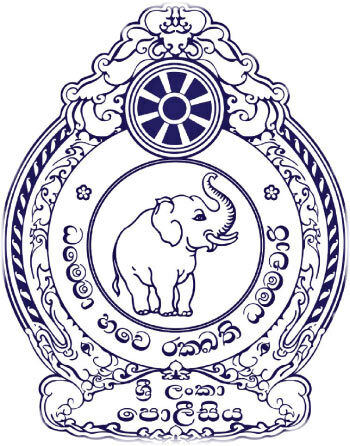 Adopting the Buddhist words of wisdom, dhammo bhawe rakkhathi dhammachari (one who lives by dhamma is protected by dhamma) as its motto, while bearing the emblem of a dauntless tusker at the centre and the dharma chakra (dharma wheel) at the top, the Sri Lanka Police are dedicated towards maintaining law and order while safeguarding the lives and property of Sri Lankan citizens. Arrangements have been made at 8 am, today, in all the Police Divisions in the country, to commemorate those who sacrificed their lives throughout history for such a prestigious service. The ceremony will be held in front of the memorial of Police Hero Sabhan, in the Mawanella Police Division in the Kegalle district, under the leadership of Inspector General of Police Pujith Jayasundara, in the presence of police officers, their family members and disabled-police officers. 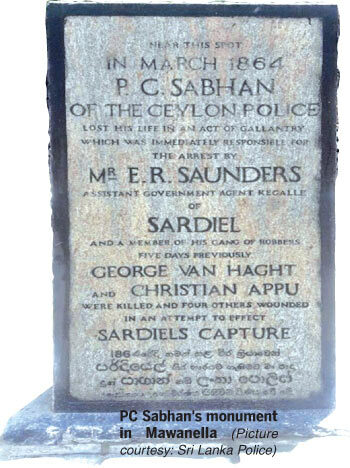 On March 21, 1864, in the Uthuwankanda area in Mawanella, in the Kegalle district, during an operation to apprehend a suspect named Deekiri Kewage Sardiel, Constable Sabhan succumbed to injuries from a gunshot fired by an accomplice of Sardiel, named Mammale Marikkar. In remembrance of Constable Sabhan, the first police officer who sacrificed his life to establish law and order in this country, March 21 has been named as Police Heroes’ Day. The Police force was formally established in 1866, and Constable Sabhan’s ultimate sacrifice, with the sole intention of ensuring law and order in the country two years prior to this, also gave an impetus to its establishment. The objective of celebrating Police Heroes’ Day is to commemorate police heroes who either made the supreme sacrifice or sweated blood throughout the last 155 years to maintain law and order and protect the lives and property of the public. All the officers who had sacrificed their precious lives had hoped for a better life for the people of this country and future generations. We should never forget the fact that the freedom we enjoy today is a result of supreme sacrifices made by those heroes. The immeasurable service rendered by police officers who are committed to serving the country and the public can never be underestimated. They are not just limited to their profession when they help your child to cross the road, while trusting someone else to take care of their own. Police officers keep round-the-clock vigil regardless of extreme weather conditions and their own comfort and leisure. Police officers are always dedicated to building a peaceful environment by preventing crime and maintaining law and order in the country. Innumerable are the instances when the Police officers were killed and injured while they were in pursuit of criminals with the aim of maintaining peace in the country. We can recall a list of police heroes who sacrificed their precious lives even in the recent past while discharging their duties. Some such sacrifices are of: Constable Chaminda Abeywickrama of the Police Narcotics Bureau who was shot dead while inside a car with his fellow officers during a raid in Piliyandala on May 9, 2017; Constable Sarath Premachandra, who was discharging duties as the Security Officer of High Court Judge Ilancheliyan in Jaffna, on July 7, 2017; Constable Prasanna Wijewardana Godagama, who became a victim of a gunshot during a narcotic raid in Monaragala, on March 7, 2018; Sergeant Dilan Sampath Dasanayaka, who sacrificed his life on May 2, 2018, while attempting to rescue a family affected by floods in the Madampe Police Division; Sergeant Ganesh Dinesh and Sergeant Indika Prasanna at the Vavunativu checkpoint in the Vavunativu area of the Batticaloa Division, who were shot dead on November 29, 2018 and Inspector Ananda Sagara Sarathchandra, who was the OIC of the Traffic Branch of the Borella Police Station, on March 10, 2019, show how valiantly they performed their duties for the country. Even tomorrow, police officers will serve the country dauntlessly, putting their own lives in jeopardy to ensure a peaceful nation where everyone can live without fear of crime. 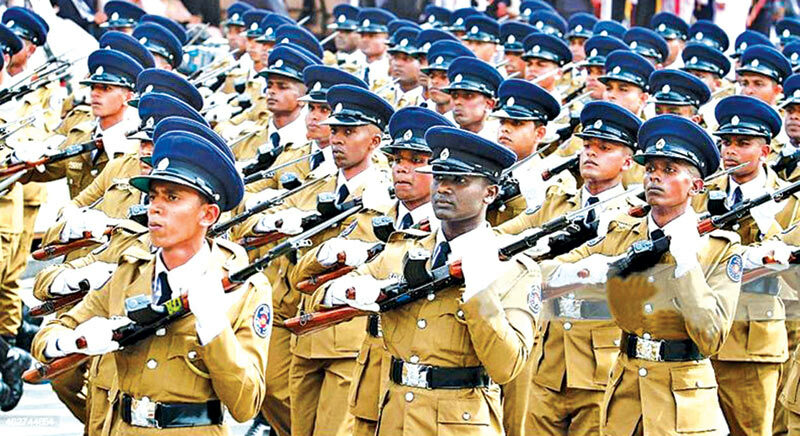 During the proud journey of the Sri Lanka Police, while facing innumerable challenges, 3,124 police officers have sacrificed their lives to protect the dignity of the police force in various ranks. In addition, 1,531 officers have become disabled while performing their duties. While appreciating the service of the police officers who sacrificed their lives, the Sri Lanka Police is dedicated to serving the officers and their relatives better, at present and in the future. Only the officers who are well trained and are dedicated to patriotism to the extent that they can perform their duties at the risk of their lives, can be the owners of the honourable mission of safeguarding the country for a better future for its people. 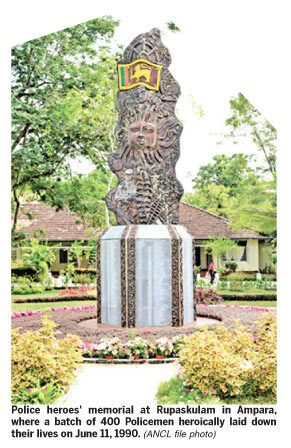 In addition, they are the guardians of lives and properties. Living away from kith and kin, police officers have worked and will work, bravely and tirelessly, for their endless mission, yesterday, today and tomorrow.